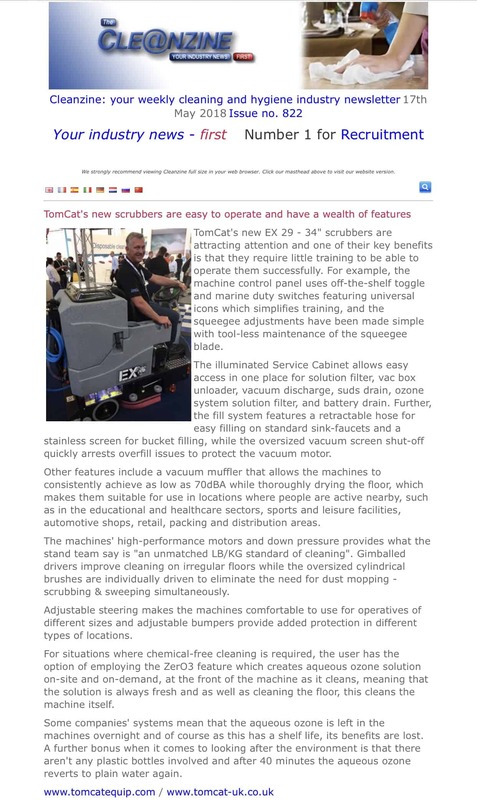 On this page you will find press releases and editorials on the TomCat & FactoryCat floor cleaning & preparation equipment brands, released through the trade press in the UK, as well as trade shows that are coming up in the UK & Europe. Looking for practical innovation in the floor cleaning & preparation equipment market ? TomCat Equipment will be showcasing a raft of new machinery & systems, for a cleaner greener way to look after your hard floors. With the all new EX, a new ride-on scrubber drier with patented vacuum protection & on board chemical free cleaning systems. John Austen from the cleanzine on line magazine gives an overview of the new EX ride-on scrubber drier, the latest addition to the range of simple high spec scrubber driers available with the 03 chemical free aqueous ozone system. The new model is available in either disc or cylinder brush styles and is packed with practical innovations to maximise productivity & enhance the operator experience.